The Los Angeles Times has got an exclusive first look for the movie Thor, including an image of Odin (Anthony Hopkins), Thor (Chris Hemsworth), and Loki (Tom Hiddleston) together in one shot. In the image, Anthony Hopkins looks really happy. 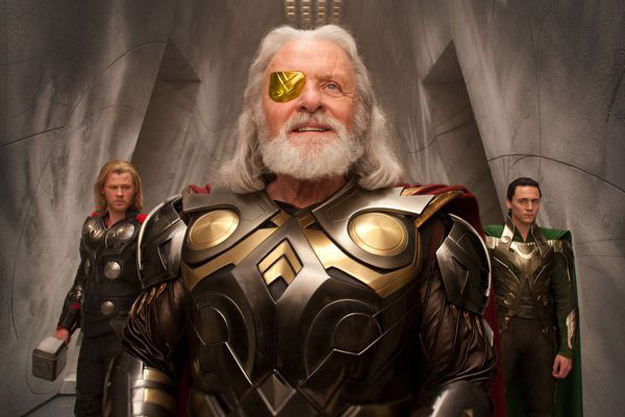 I’m not sure why, but I’m going to assume that eyepatch of his is displaying a naked Norse goddess. You can also see Thor’s hammer, Mjolnir. It’s announced that both Thor and Captain America: The First Avenger will be coming to theaters in 3D, but will be converted in post production. The filmmakers promise that it won’t be bad like other 3D post-conversions like The Last Airbender and Clash of the Titans. “We came to feel that in our case 3-D could be the very good friend of story and character for a different kind of experience,” says Thor director Kenneth Branagh. Some big announcements will hit San Diego Comic-Con International for all the Marvel movies, including The Avengers. So stay tuned. Thor hits theaters May 6, 2011 while Captain America will hit theaters July 22, 2011.